Ok, I know I already posted a recipe for Red Velvet Cake, but it's always such a hit, I figured why not do another one? As I always say, more is more, right? So when I was asked to make cupcakes for a recent event, I thought I'd turn to Miss Paula Deen and give her recipe a try. SWOOSH! They were gone in no time flat! Everyone loved them! What is it about red velvet cake that always pulls everyone in? 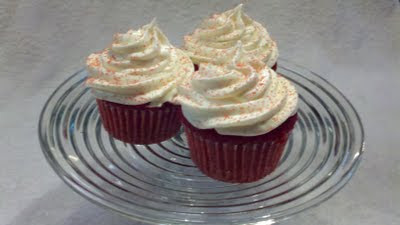 It seems that any time I mention red velvet cake, everyone begins to "oooh" and "ahhh" and "mmm". It happens every time! I guess everyone loves the velvety moist texture of the cake and of course the cream cheese icing puts it over the top! LOVE it! Thanx, Miss Paula. Garnish with chopped pecans and a fresh raspberry or strawberry. Frost the cupcakes with a butter knife or pipe it on with a big star tip. I must confess, I don't use Miss Paula's frosting recipe. The Cream Cheese Frosting that I like uses the same ingredients, but has a slightly different sugar to butter/cream cheese ratio and it's a bit softer and creamier. I like to use salted butter because it really brings out the flavor of the butter and cream cheese.